Water Heater Maintenance | Reliance Plumbing Sewer & Drainage, Inc. The traditional water heater—the storage tank model—is pretty big, usually very noticeable, and often a bit noisy. As such, many homeowners realize a system such as this needs occasional maintenance, and are likely to schedule that service on a regular basis. After all, scaling can have a major impact on a water heater, enabling a mineral build up that clangs around noisily inside the tank, causing issues with pressure, temperature, and potentially even corrosion. They also may need flushing on occasion to offset this issue. 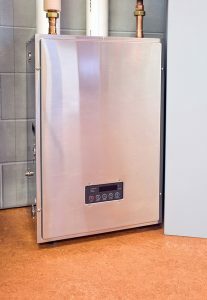 What many homeowners don’t realize, however, is that if they have a tankless water heater, it also needs maintenance. And you may be surprised to learn that much of the maintenance performed on tankless systems is similar to that of storage tank water heaters. Keep reading to learn more, and be sure to call our team for your next water heater maintenance appointment.